Rush C. Hawkins (1831-1920), Colonel, 9th New York Infantry (Hawkins Zouaves) and Brevet Brigadier General, USA (NY). Participated at Hatteras Inlet, Roanoke Island, Fredericksburg. 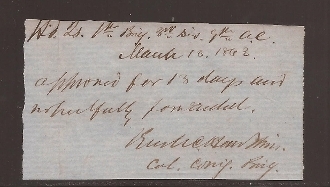 Clip Autograph Endorsement Signed (AES), Hd.Qs., 1st Brig., 3rd Div., 9th A.C., March 13, 1863 as Col. Comdg. Brig.